The modern world has no limits when it comes to attacking the virtue of chastity and the state of virginity. The audacity and inanity of the latest assault, however, left me stunned. Under the topic Women’s Health, Fox News reports with all seriousness the proposal that nuns should be offered the contraceptive pill on health grounds, because it would supposedly cut their risk of getting cancer. According to a study in online medical journal The Lancet, “The vow of chastity taken by the world's 95,000 Catholic nuns carries with it an increased risk of breast, ovarian and uterine cancers – all of which are more common in women who do not have children.”(1) They affirm that lack of pregnancy and lactation means childless women have more menstrual cycles, which increases cancer risk. The study authors, Kara Britt of Monash University and Roger Short of the University of Melbourne, pretend that taking modern contraceptive pills could be the answer to the “problem.” It is one of those problems, obviously, that no one knows about until he is duly informed by academic committees and the media. They base their conclusion on statistics that show overall mortality in women using the contraceptive pill is around 12% lower than in those who have never used it and the risk of developing ovarian and endometrial cancers falls by 50% to 60%. What these doctors fail to report is that this lone physician Ramazzini – whose study was resurrected by Planned Parenthood to fit its agenda – also reported the virtual absence of cervical cancer in nuns. He speculated that this protection was also related to their chaste lifestyle. But this part of his findings is purposively left out, leading the public to surmise that nuns and religious women from the time of the Middle Ages were less healthy and suffering from diseases caused by their virginity. So, based on this tailored conclusion, now these doctors pretend that modern science will resolve the problem with the birth control pill. The birth control pill is presented as the magic solution to bring better health to the chaste nuns. In fact, there are many married and unchaste women taking the pill who have breast cancer and, according to other better-researched studies, they suffer a significantly higher risk of cervical cancer. These women also face a myriad of other side effects that make the so-called “cure” much worse than the potential risk of having the disease. Indeed, as the body tries to adjust to increased estrogen and progesterone levels induced by the pill, women can experience a constant feeling of nausea, morning sickness, bloating and weight gain, acne, headaches, mood swings, hypertension and decreased resistance to infection. These are just some of the short term effects of the pill. So, it seems to me quite irrational that, to reduce a hypothetical risk of getting breast cancer, these nuns should take the birth control pill, which involves a proven higher risk of getting cervical cancer, along with the legion of other bad side effects mentioned. In a long term research project dubbed the Nun Study, Dr. David Snowdon studied 678 Catholic nuns from 75 to 107 years of age who took the vow of chastity at the average age of 22. What he found was that these religious women actually lived longer and healthier lives than lay women. In 1986 he published his discoveries in a book titled Aging with Grace: What the Nun Study Teaches Us about Leading Longer, Healthier, and More Meaningful Lives. It was not the birth control pill that kept these nuns healthy mentally and physically, but their virginity that directed them to a calm, structured life and a simple and regular alimentary diet. I am not sure that a study about modern nuns living in apartments, immersed in the world, engaged in social justice, and having an ambivalent attitude about chastity would provide the same results. 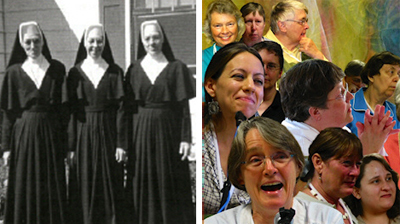 The religious women in the Nun Study had been trained in the pre-Vatican II Catholic Church, when the lifestyle of nuns was healthful both spiritually and physically. This holds true all the way back to the Middle Ages. 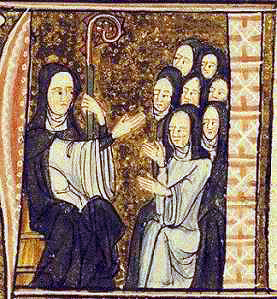 All the works I came upon during my study of medieval history confirmed that the index of longevity for nuns in medieval Europe was higher than for married women. One reason for this was related precisely to their vow of chastity: the religious women did not face the risk of dying in childbirth. Not only did nuns in the Middle Ages live longer, but they led remarkably active lives into their old age, more so than the average women of the period, including the noblewomen. Just a few examples: Hildegarde of Bingen (1098-1179) founded a new convent near Rupertsberg at age 52 and another in Eibingen at age 67. Juliana of Falconieri (1270-1341) founded the female Order of Servites when she was 63 and headed it until her death at 70. The mystic Mechtilde of Magdeburg (1210-1297) entered the convent of Helfta in her early 60s and died there at age 87. Will the Vatican approve the nun’s pill? In the present day progressivist climate of the Church, one can only wonder whether this new attack on virginity will receive the approval of the Vatican. 4. "Everyday Life, Longevity, and Nuns in Early Modern Florence," in Everyday Life in Early Modern Europe: Practice and Representation, Patricia Fumerton and Simon Hunt, eds. (University of Pennsylvania Press, 1998). What Is to Blame for the Demographic Catastrophe?